Welford = well funny. These quirky, cool tales have witty surprises hidden around every corner. Enjoy! 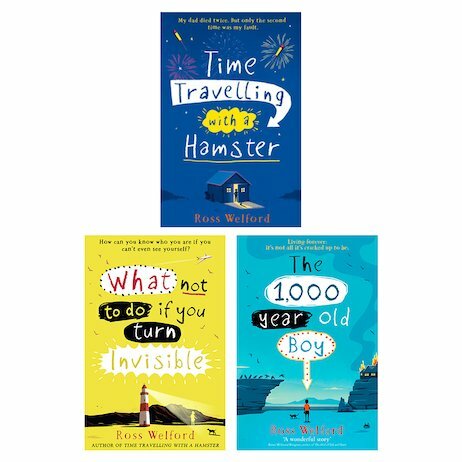 Imagination, humour, a dreamy touch of the impossible: if you imagine a book with all those things, you’ve pretty much dreamed up one of Ross Welford’s novels. Turning invisible. Living to be a thousand years old (but still a kid). Zooming into the past with your pet hamster. You definitely will laugh out loud. Still, there’s always something a bit more serious going on in these cool novels, too. Like a boy’s quest to save his dad’s life. Or the mission to be brave and belong. So don’t be surprised if, even as they make you smile, these lovely books also (just a little bit) break your heart.